In place of eno (fruit salt), a mix of baking soda+ baking powder (50:50 ratio) can be used. Mix the gram flour and semolina and mix it, adding water to make a paste. The paste must neither be too thick nor too runny. Mix well. Add salt, 1 tsp. sugar, grated ginger and lemon juice to it. Mix well and keep aside for 20 minutes. Take a wide microwave safe dish and grease it with little oil on the bottom and the sides. After 20 minutes, add the eno (fruit salt) to the mixture and mix well. The mixture will start to rise. Mix and pour in the greased microwave dish. Cover and microwave for 3 minutes on high. Check the dhokla after 3 minutes with a knife. 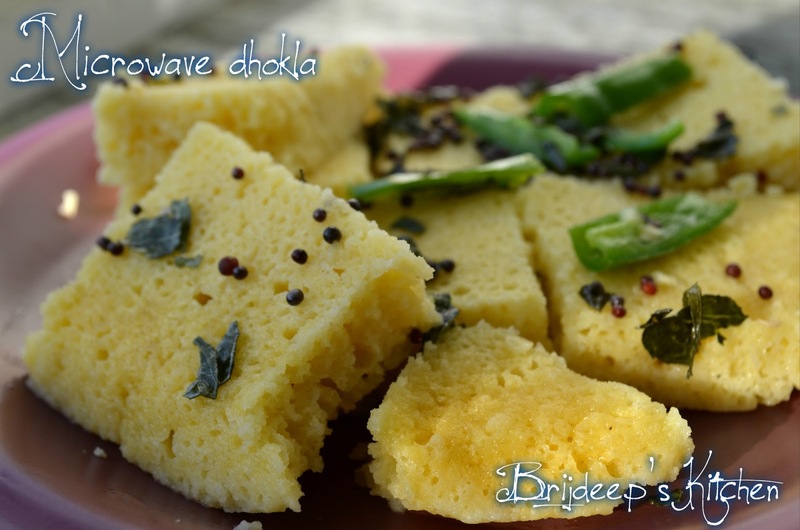 If the knife comes out clean, then the dhokla is done. If not, microwave for another minute. Uncover and let it sit for 2 minutes. For the tempering, on a shallow skillet, heat the oil and add mustard seeds. When they splutter, add curry leaves and let it cook for about 10 seconds. Add slit green chillis to the pan. Let it cook for about a minute. Now add about half a cup of water and 1 tsp. sugar. Let the water boil and then turn off the heat. pour this tempering over the cut dhokla pieces. Garnish with coriander leaves (optional) and serve with green chutney. Loved this recipe? Please do leave a comment/feedback and join me on my Facebook Page for regular recipe updates. This recipe is the most viewed of all recipes and has been tried by so many people from all corners of the world. A lot of people keep sending me feedback when they try this recipe and here's a compilation of all those lovely pictures I received as a feedback from my readers. If I have missed your picture, please understand that it is not intentional and kindly leave a comment below and send it to me again. 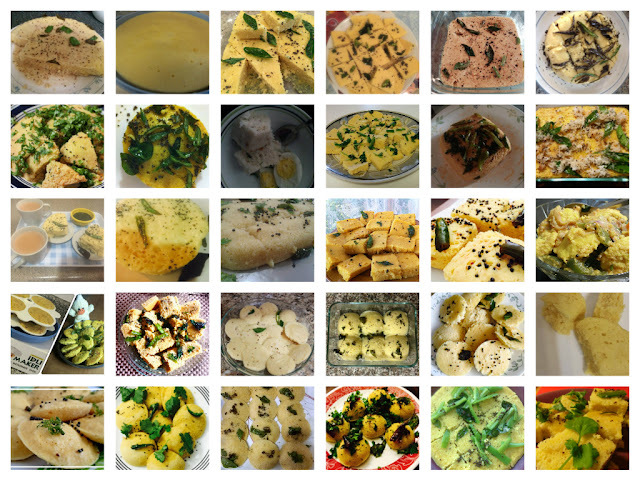 If you try the recipe, do send a feedback at my Facebook Page and I'll add your feedback. Hello i tried it today but the dhokla turned out to become hard and did not cook well. I cooked it in idli steamer with dhokla plate. please suggest what could have gone wrong? Hi Malika, sorry for the late reply. Did you keep it for 20 minutes when you made the batter? Also did you use something else in place of eno? If everything was same, it could just be because you need to add more water when you make the tempering, the dhokla will absorb all the water and will become very soft. What can I use instead of Eno? 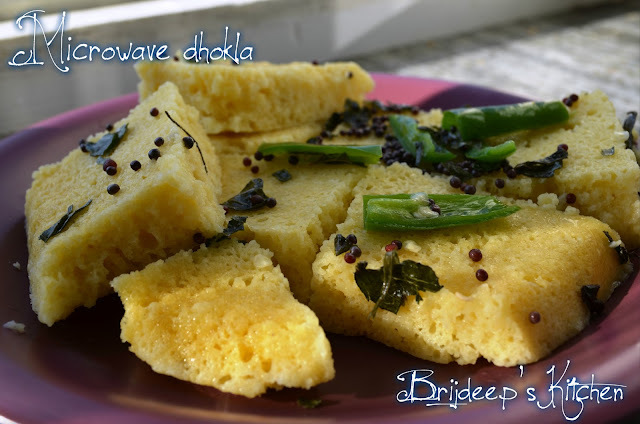 very easy recipe so went ahead to try, Dhokla got very well puffed in the microwave but as a end result dhokla was really very dense and tasteless. Followed the exact recipe and accurate measurements as mentioned but end result was really very disappointing not sure where i went wrong.. Any tips? Hi.. I'm really sorry that happened with your dhokla. Please help me with the following: did you add salt? did you skip on the sugar? was the water boiling (and not cold) when you added the tempering to the dhoklas? Basically dhokla is supposed to be not very spicy and that's why it is usually served with green chutney. The only flavor it gets from the salt and sugar in the batter, the green chilli and ginger which is added to the batter and kept for 20 minutes so the flavor is absorbed. If you skip any of these things, it will be tasteless. take 1/2 cup water, let it boil and turn off the flame. If you have trouble with water quantity, pour in small quantities with a big spoon until the dhokla stops absorbing more water. then you know it's ready! Hope this helps..